UPDATE Nov 8th: My local banker has let me know that if you have a friend who got a targeted promo code and isn’t using it, they can give it to you to use with your upgrade to CPC and $100,000 deposit for 50,000 Ultimate Rewards. In fact, if your friend just has their banker look up their profile and issue the promo that way, the actual code should still be useable by you. Unfortunately, no update on what amount the 1099 you will almost certainly get will list the value of 50,000 URs at. 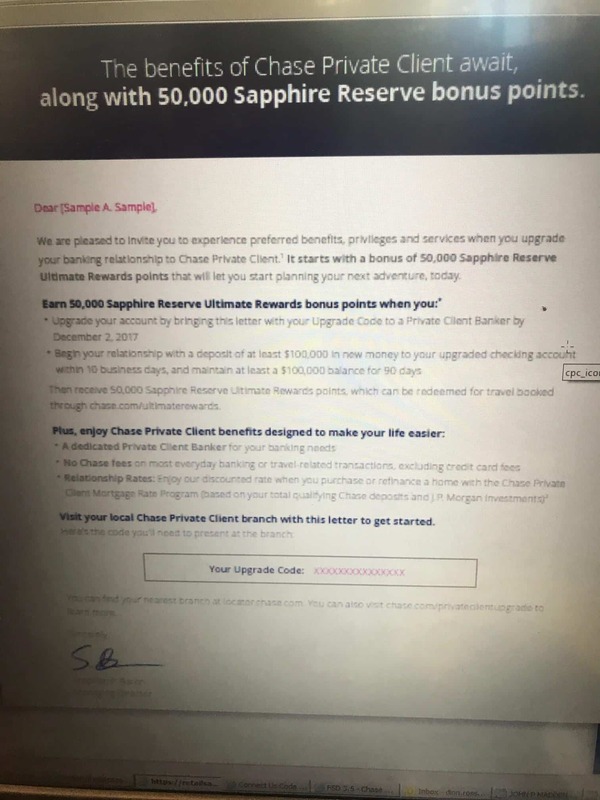 This morning, Chase kicked off (and by kicked off I mean that people got offers in email but Chase’s back office mostly had no idea) a promotion offering regular checking customers that hold a Chase Sapphire Reserve card a 50,000 Ultimate Rewards points bonus. I spent about an hour with a Chase Private Client banker in NYC this morning getting you the scoop. If targeted, (check your email and snail mail) you can upgrade your account to Chase Private Client and deposit $100,000 for 3 months to receive 50,000 Ultimate Rewards points. If you did not receive the offer, Chase bankers likely have no way to add the promo. It will be “in your account” and the offer code isn’t actually entered anywhere. But if it’s not in your account, the CPC banker has no way to offer you the promo. If you did not receive the offer, Chase bankers likely have no way to add the promo. It will be “in your account” and the offer code isn’t actually entered anywhere. But if it’s not in your account, the CPC banker has no way to offer you the promo. If you are already Chase Private Client (CPC), you are NOT eligible to deposit $100k in new money to receive the offer. If you are not already a Chase banking customer, you cannot get this offer because you will not have been targeted. It is not clear if this is being sent to Reserve cardholders only or both Reserve and Preferred cardholders. The promo goes until December 2, 2017. One more thing: They DO say that the points will have a 1099-INT issued against them. I am trying to find out the value Chase plans to assign. Stay tuned. OK, so those are the details after having the CPC banker call 4 people in the back office for clarification (the first 2 hadn’t heard of it). This is clearly an attempt to upsell regular customers into getting the Private Client relationship going, but I don’t quite understand why they won’t allow existing CPC clients to bring over more money and get the promo. They are already Chase’s best customers and this is certainly going to anger many CPC customers. If I was CPC right now (which I am not), I would withdraw funds in protest. I told the banker I’d be happy to signup for a Chase account and meet the offer terms but, likewise, he could not do that for me either. You have to already be a customer. So what I did was open a standard checking/savings account set using the current $500 new account bonus (you can get one of these per calendar year) which is currently $200 with a new checking account with direct deposit and $300 more for depositing $15,000 for 6 months. I’m *hoping* that now that I have an account I’ll be targeted and I will certainly update here if I am. Thoughts on this promotion? Are you eligible? Does it make you want Chase Private Client more or less? 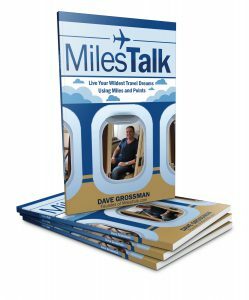 Let me know here, or on Twitter, or in the private MilesTalk Facebook group. H/T to Deals ATX who first mentioned this was going around and prompting me to do the research. I was told that I can’t upgrade until I bring in $250k. I made several trips to the bank and basically was denied unless I can bring in $250k. That’s not how CPC works. 100k is all you need for this offer. Have you tried more than one branch? If you have the offer code, I can set you up with a CPC banker in NYC.